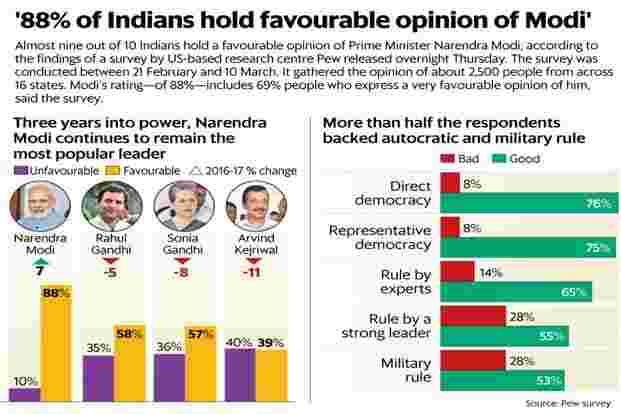 New Delhi: Almost nine out of 10 Indians hold a favourable opinion of Prime Minister Narendra Modi and more than two-thirds are satisfied with the direction in which he is taking the country, according to the findings of a survey by US-based Pew Research Center released Thursday. Modi’s rating of 88% includes 69% people who express a very favourable opinion of him, said the Pew survey. And this number was 31 percentage points higher than that for Congress president Sonia Gandhi. The survey was conducted between 21 February and 10 March—a little more than three months after Modi announced demonetisation of Rs500 and Rs1,000 notes on 8 November to curb corruption and unearth black money. It gathered the opinion of about 2,500 people from across 16 of India’s most populous states in the poll conduct in eight languages. The survey results come against the backdrop of criticism of the way Modi’s Bharatiya Janata Party-led National Democratic Alliance (NDA) has been handling the Indian economy, especially in light of reforms such as demonetisation and goods and services tax (GST). The prime minister has also faced flak for India’s slowing economic growth and for failing to generate jobs needed for the approximately one million youth joining the workforce each month. “Three years into Modi’s five-year tenure, the honeymoon period for his administration may be over, but the public’s love affair with current conditions in India is even more intense," a note explaining the results of the survey said. Modi completed three years in office on 26 May this year and has some 18 months to go before 2019 Lok Sabha elections. The Pew survey noted that the highest approval ratings for Modi of 95% came from the southern states of Andhra Pradesh, Telangana, Tamil Nadu and Karnataka, followed by the western and central states of Maharashtra, Gujarat and Chattisgarh at 92%. Gujarat is to go to the polls in two stages next month with results due on 18 December. “Young Indians, those aged 18 to 29, show slightly greater intensity of support (for Modi) than their elders, ages 50 and older," the note said, adding “no other major political figure in India approaches Modi’s level of public support". Despite the slowdown in the Indian economy, “there is absolutely no disagreement between different demographic groups about India’s economic situation. Overwhelmingly all groups believe that the economy is doing well including three quarters of Congress party supporters", Bruce Stokes, director (global economic attitudes) of Pew Research Center, told an audience at Brookings India, in New Delhi on Thursday. But 73% of those polled said “a lack of employment opportunities is a very big problem in India", the note said adding 74% cited corrupt officials as a problem and 76% said terrorism was a very big challenge. “Despite periodic outbreaks of religious violence, relatively few Indians see communal relations as a very big problem. Similarly, despite Prime Minister Modi’s decision last November to abolish high-value bank notes, less than half of the Indian population sees the lack of availability of cash to be a major problem," the note said. According to the survey, “about six-in-ten Indians expressed a positive opinion of the Congress party", a note explaining the survey findings on the Pew website said. “But the gap between BJP and Congress backing, which was 26 points in 2015 and then narrowed to 13 points in 2016, has now widened again to 25 points. Indians in rural areas (63%) are more supportive of Congress than those in cities (51%). Those with a primary education or less are more likely to back Congress than are those with at least some college education," the note said. Interestingly, the survey found that 60% of Congress supporters have a favourable view of the BJP while only 45% of BJP backers hold a positive opinion of the Congress.